If you're not delighted with your Sto-It just tell us within the first 30 days we'll give you a full refund of all your money. This will open a new window with the Sto-It PDF brochure. Our installation manager will contact you to discuss various aspects of the installation. We will need to know what are the height restrictions of the garage. This is usually posted on a sign at the entrance to the garage. Are there any obstructions, water pipes, air ducts etcetera in the area where you intend the Sto-It to be installed. After establishing that a standard installation can occur our installation manager will plan with you a suitable date / time for the installation. This is usually within three weeks of purchase of your Sto-It. Installation times are normally Monday to Friday (excluding Bank Holidays) 7.00am - 6pm. Usually, we can offer morning (7am - 12 noon), midday (10am - 2pm) and afternoon (12 noon - 6pm) installation slots, although this may vary depending on the traffic or other unforeseen delays. For an additional charge we can also deliver in the evening or on a Saturday, these deliveries are usually made between 7.00am - 3pm. Two days before the agreed delivery our installation manager will contact you to confirm our installation arrangements. On your installation day, our drivers should phone ahead before they arrive (unless it's an early morning installation) so you'll know when to expect us. You or someone on your behalf has to be there to allow us to gain access to the car park and to point out which car park space the Sto-It has to be installed in. If there is no one there when we arrive and we have to leave without completing installation, a new installation date will be arranged but there will be an additional charge. Your Sto-It is delivered on a specially modified vehicle. Once in the car park the Sto-It is mechanically lifted off the vehicle and maneuvered into position. The legs are then set at the appropriate height for your vehicle. 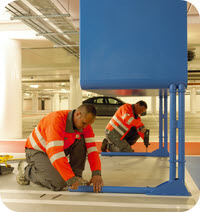 The Sto-It is then bolted to the car park floor using six masonry bolts. Each installation takes less than one hour and is performed by our fully trained installation team giving you peace of mind. To arrange for one of our Customer Support Team to call you at a time that suits you just click the link above.